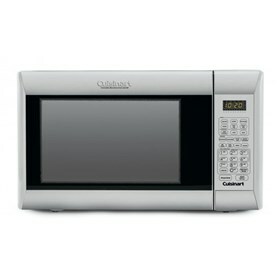 The Cuisinart Oven & Grill comes with 1.2 cubic foot capacity, looks like it belongs in a high-end commercial kitchen. It has a brushed stainless steel and black frame, sleek control panel that offers single and combination settings for an unlimited number of cooking options. A multi-stage cooking feature that automatically shifts from one function to another makes perfect results easier than ever. The Convection Microwave Oven With Grill has many exciting features for users of all types. You can extend the lifetime of your Convection Microwave Oven With Grill with the purchase of a FactoryOutletStore Factory Protection Plan. See the Convection Microwave Oven With Grill gallery images above for more product views. The Convection Microwave Oven With Grill is sold as a Brand New Unopened Item.